Bobby Patrick, director of bands at Phil Campbell H.S. in Alabama (and visual caption head for Memphis Sound), sent in this one. 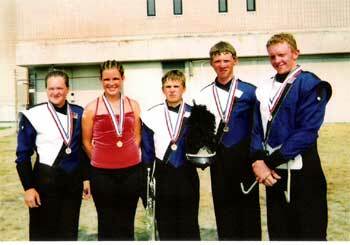 "(From left to right) Terri Bell, Kaitlyn Patrick, Matt Burleson, Chris Nix and Will McAlister. The four kids on the left all come from a small school in North Alabama -- Phil Campbell High School. Will is a college student from a local Alabama JuCo - Northwest Shoals C.C. Photo was taken after Grand Finals in heat that was reminiscent of the Deep South! See, even Southerners sweat in heat like that!" Thanks Bobby! E-mail your best shots from the summer to dave@dci.org along with where and when the photo was taken. Send some biographical information about yourself as well. We'll give you full credit. Also, let us know if you want your e-mail address included.